Drunk Nothings: Can you eat this?? Eagle’s Deli is a hole-in-the-wall grill with one heck of a he-man burger. If you thought their three-pound Reilly burger was a beast, the five-pounder will blow your expectations clear off the bun. Piled with 10 half-pound patties, the sky-high stacking is held together by a wooden teriyaki stick. 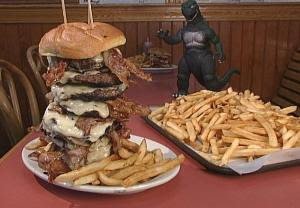 It includes 20 strips of bacon, 20 slices of cheese, and 5 pounds of fries. Finish the whole think in under an hour, and you’ll get your money back ($100!) and the burger named after you. The deli also cooks up awesome corned beef and turkey tips. Can you eat this? The Chillerma!! If you can eat it, plus another 1/2 lb burger and 1/2 lb of fries, they will name it after you. I have a MAN who is willing to make the attempt. He is in serious training right now. I will keep everyone updated with the training and when this is going down. Stay tuned for this show down. Is anyone else willing to make an attempt?? I could do it but not eat all them fries. Please tell me its William J Smiddy!